Electricity is a tool used by nearly everyone on the jobsite. 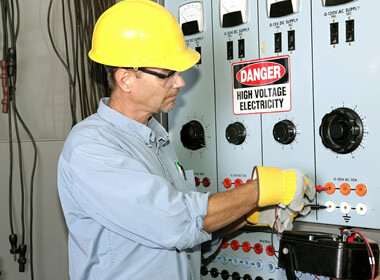 Safety Aspects can help you bring your company into compliance with OSHA Safety Standards and Requirements, and provide your employees with the knowledge and training to work with electricity safely. Safety and health programs are required to address electrical incidents and the variety of ways electricity becomes a hazard. In general, OSHA requires that employees not work near any part of an electrical power circuit unless properly trained and protected. There are a number of causes of shock, electrical burns and electrocution. If the power to electrical equipment is not grounded, the grounding path has been broken, or there are live parts or bare wires, a fault current can travel through your body. Even when a piece of equipment or a tool is properly grounded, it can instantly change from safe to hazardous because of extreme conditions or rough treatment. So employees need to know what hazards to watch out for and how they can protect themselves. Our certified OSHA Outreach Trainers will demonstrate to your team the need for proper safety precautions when working with electricity. We can also help your company reach compliance with OSHA Safety Requirements.